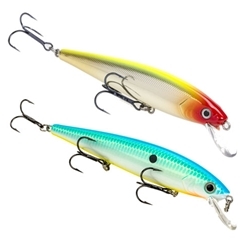 Strike King's KVD Slash Bait is the jerkbait with the perfect combination of roll, wiggle and flash to attract fish. It combines weight transfer system for increased castability, 3D eyes and premium black nickel hooks for that action that ONLY the Slash Bait can give. Jerk on slack line for that maximum action and watch out! These jerkbaits dives 4-7 feet. NOW AVAILABLE in a Deep 4-3/4" which will dive to 11ft!!! Quantity Size 4-3/4" Deep 4-3/4"